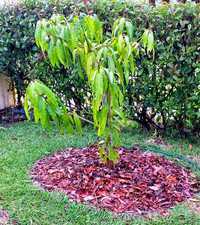 Garden Mulch is great for conserving moisture in the soil for all trees and plants. Not all plants and trees are same so different plants need different mulches. Some mulches like organic mulches will break down quicker, while inorganic mulches do not break at all (A Guide to Mulching). 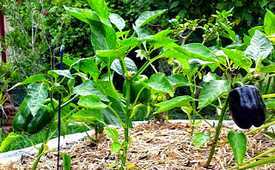 There are so many mulches, so one is confused which mulch should be used for which plant. Following is a guide on which mulch you should use and where. Composted Manure and Compost can be used to insulate and give a boost of slow released nutrients during the growing season. Bark mulches do not mix well into the soil. These may be used around shrubs, trees and in garden beds where a lot of digging is not required. Grass Clippings can be used where you want to suppress weeds. Gass clippings create a water resistant mat that do not allow water to pass through. If you have used weed killers on your lawn, its clippings may adversely affect the plants where you muse them for mulching. When you mow your lawn, you can leave the clippings on the lawn to add fertility to that soil or put it into your compost bin. Newspaper and Cardboard: Shredded newspaper and layered sheets of newspaper act like other organic mulches and they are very good in suppressing weeds. They can also be used to start a new garden bed. Shredded Leaves are free and can be used anywhere in the garden. The leaves ultimately decompose and mix up in the soil. Straw and Hay are popular mulches for the vegetable garden and strawberry patch. Straw breaks down quickly, adding nutrients to the soil. I consider straw better than hay as the straw has the stems of plants, while hay has the seed heads, which will sprout into weeds in the garden. Wood or bark chips look attractive and decay slowly. Pine bark mulch is acidic, so it is suitable for azaleas, blueberries and other acid loving plants. Mulches can be used in keeping with the landscaping of your garden. It can give a change to the appearance of your garden. 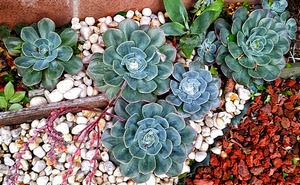 For a bright looking garden, use a mulch of bright gravel and pebbles. For a soothing looking garden, use organic bark or compost mulches. For an airy mulch, use thicker layers of coarse mulches like straw or bark chips. Use organic mulches that break down to add organic matter to the soil. If the mulch is dry and woodier, it will decompose slowly and the less nutrients it will give to the soil. Grass clippings, leaves, straw, pine needles are best for vegetable gardens. For some vegetables where you need to heat up the soil like melons and other warm-weather crops in cooler climates you can use plastics. Black plastic inhibits seed germination so the weeds do not grow. Bark, wood chips, stones, rocks, gravel can be used for flower beds. Use a thick layer of newspaper or a cardboard.